Earlier this week I received one of the best CD double albums in a long time: John Dengate’s Australian Son, which is now distributed by Shoestring Records in the Blue Mountains (and run by folksinger Pat Drummond). Dengate “was the closest heir to the legacy of Henry Lawson that this country has known”, writes Warren Fahey, in the Dengate obituary published in the Sydney Morning Herald obituary on August 19, 2013. Many of Dengate’s songs “have already passed into that hazy territory where the song is known and the songwriter anonymous”, Fahey writes. “Train Trip to Guildford” (1975) is one of them. This song was also my ode for a two and a half year period in the 1980s that I spent travelling by train all over Western Sydney. The next train’s the quarter past five. We’re rattling towards Emu Plains. Sydney (Carlingford) born, Dengate captured this time and place – those interminable Western Sydney train journeys – during the age of the unheated “red rattlers” and prior to the construction of the “Y link” that connected Harris Park and Parramatta, the southern line to the Western line without having to change trains. I worked in Blacktown then, for the Western Sydney Regional Organisation of Councils (WSROC), and I didn’t own a car. What was I thinking? So I listen now – some 30 years later – to Dengate’s voice and his songs, yet again (my cassette tape of his songs long unusable). It was another time and another place, but that Australia of the 1970s and 1980s that Dengate writes and sings about makes us who we are now. Worth listening for anyone who has a sense of social history, or wants to understand. “Begin Again” is one of those romantic overcoming adversity fantasy films that is just grounded enough for you to suspend disbelief. I loved it. Irish film director John Carney originally broke onto the scene of small, warm, musically-themed films with his “Once”, a delightful drama of two mismatched musicians in Dublin who go against the odds. With “Begin Again”, the action switches to New York City, and he has enlisted a strong cast to tell a similar story. The result is highly entertaining and upbeat, guaranteed to make you believe that yes, your dreams are possible. Dan Mulligan (Mark Ruffalo) is a former music executive who co-founded an independent label with partner Saul (hip hop artist Mos Def), but has fallen on hard times: separated from his wife Miriam (the ever strong Catherine Keener), he wanders the streets in an alcoholic haze and tries vainly to be a father to his 14 year old daughter Violet (Hailee Steinfeld). Gretta (Keira Knightly) is a sensitive singer-songwriter who has come to New York with boyfriend Dave (Adam Levine from Maroon 5), who in turn becomes a star, and in turn leaves her. On her planned last night in New York, Gretta reluctantly takes the stage at an East Village nightclub to sing one of her songs, cajoled by old British friend Steve (James Corden). That’s where Dan hears her, and the result is a magical scene where Dan can hear and envision all of the instrumentation behind Gretta’s song. Director Carney does a neat job of presenting both Gretta’s and Dan’s stories to us (neatly filling in the backstories of the day leading to their propitious first meeting). From there the film takes a familiar, but still highly satisfying course. Yes, Dan convinces Gretta to stay in New York City, and yes he produces an album of their songs. But the gimmick is that because they don’t have enough money to afford a studio, they record the songs at various locations around the city: on a subway platform, on boats on Central Park lake, in an alleyway, and on a rooftop with a view (of course) of the Empire State Building. No prizes for guessing the outcome, nor for the inevitable Gretta-Dave reunion, nor for how daughter Miriam’s life is changed, etc etc. Sound predictable? Perhaps. 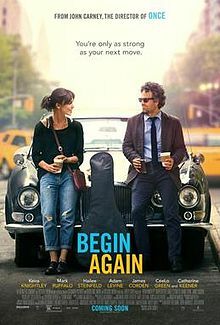 But the true delight in “Begin Again” is the film’s irrepressible good humour, absolute adoration of modern music (writer/director Carney used to play bass for an Irish rock band, so he knows what he films) and an almost pitch-perfect cast. Ruffalo is a great music exec who needs to prove himself again; Knightly, singing with her own voice, brings just the right combination of vulnerability, energy and style to her role; Keener virtually defines the ever-suffering former wife; Steinfeld is the adolescent daughter needing direction and attention; Corden is the perfect “best friend” who has just what Knightly’s character needs; and as real-life musicians both Mos Def and Adam Levine play important roles. If we did not believe the tension between Def’s character and Ruffalo’s, nor if we did not believe the Levine-Knightly relationship, the film would not have worked. Yet it does. “Begin Again” is about … yes, rebirth, following ideals and the possibility (indeed the necessity) of reinvention. Director Carney understands this basic element of the American character, and brings it to screen in such a buoyant way that we cannot help being charmed into liking both the film and all of its characters. He is only one of five people who have their own “category” on this blog. He has been my favourite musician since 1983 – more than 30 years now. 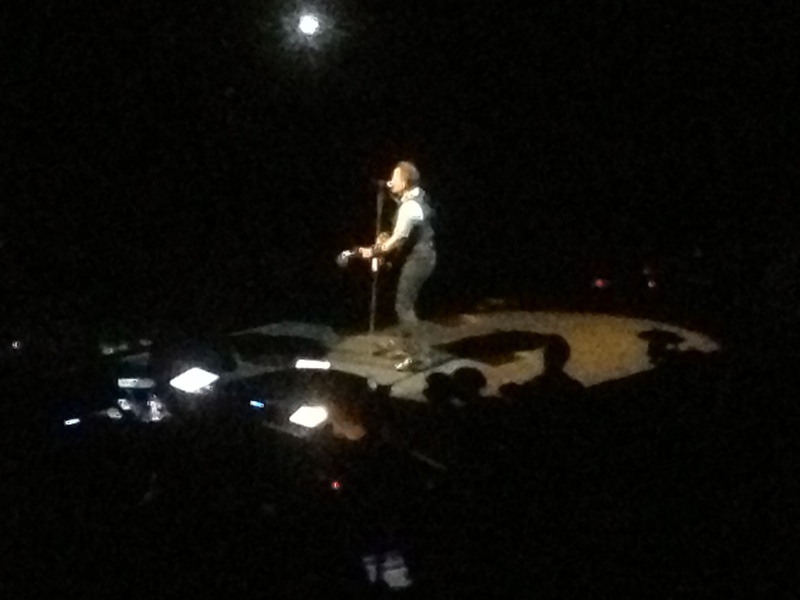 It’s Bruce Springsteen. Last night here in Australia, SBS TV broadcast the documentary “Bruce Springsteen and I”, a collection of delightful and frequently moving testimonials by Springsteen fans, interspersed with the man’s music. 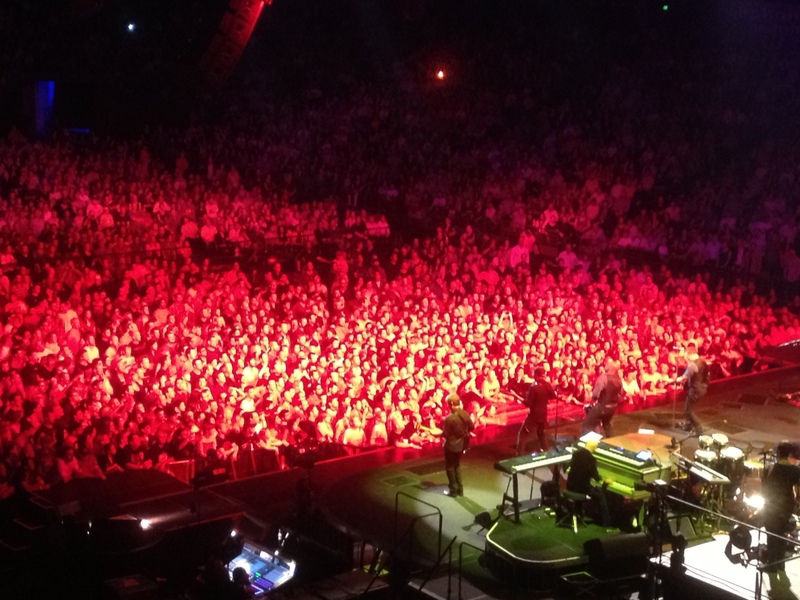 Cleverly, in many cases peopled told a story about a certain concert that they attended and how they were called on by Springsteen to sing, or come up on the stage for a hug (he does that sort of thing) or whatever. And we get to see the original footage as well, edited into their stories. 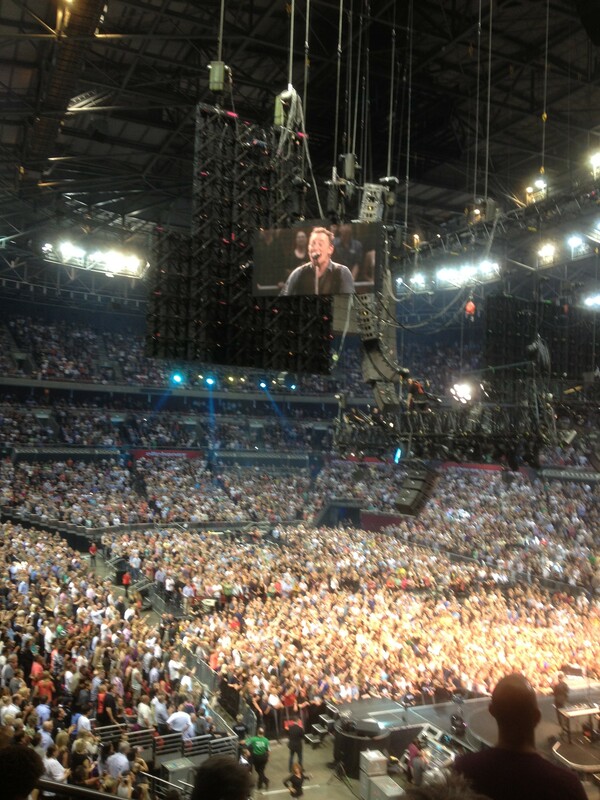 A truly moving experience for Springsteen fans, now on sale here in Australia on DVD. Spell their names correctly. A “cardinal” rule of public relations. To which I add “pronounce their name correctly”. There is no mystery why some salespeople insist on mentioning your name again and again when they are trying to “make the sale”. Few things sound so sweet to someone than the sound of their own name. There are few “personal” public relations mistakes worse than sending correspondence with mis-spelling. It shows you don’t care enough to check. Or you made a mistake and did not notice. You don’t really know them well enough. In all of these cases, it’s a “turn off”. It shows you simply do not care. I speak from experience. While my first name is easy, my last name is not. One result is that I usually make restaurant bookings with my “official” first name, “Donald”. Have done so for many years now. And I am endlessly fascinated by the mis-spellings of my surname (last name), with “P-e-r-i-g-u-t” and “P-e-r-g-l-u-t” being the two most common, or adding an extra “a” (you guess where), or changing the “gut” to a “man”. Of all of them, it’s the transposition of the “g” and the “l” that bothers me the most, mostly because it’s simply not a pretty name that way. And I have one correspondent in an academic institution who continues to use this mis-spelling, many years after I first pointed out the mistake. Recently, the importance of names was reinforced by a story told on Australian radio by American cellist Alisa Weilerstein: there’s a reasonably difficult last name. And that was the point of it all. In an extended interview on ABC’s Radio National’s “Breakfast” program on 12 June 2013, she told the story of how she played at the White House in 2009 with President Barack Obama and First Lady Michelle Obama and their family in the audience. As Weilerstein tells the story, the President introduced them all at the beginning, but stumbled over her name. Oh well, she thought, it’s a hard name, many people do. But at the end of the concert, the President was determined. Obama specifically thanked the musicians by name at the end, and carefully pronounced Weilerstein’s last name correctly – and looked right at her as he did so. That’s what the President of the United States of America does. He pays attention to names, because he knows that they are important. We should recognise that too. It’s only his third concert tour to Australia, and I missed the first two. So we went on 20 March. Summary: the most accomplished stage performer I have ever seen, but the music was too loud, too brassy and hard to understand. I guess most of us knew the music anyway. I sure did. When he strolled through the crowd while singing (I can’t remember the song, but the event was riveting), and then perched himself on a ledge in the middle of the audience, while audience members held him up. He then crowd-surfed over the mosh pit back to the stage, held aloft of hundreds of fans. I was rapt, and just about everyone else was too. When he brought the little kid on stage with him to sing. When he chose audience members’ signs identifying songs to sing. When – near the end – he danced with a female fan whose flip chart he had read out during the concert. We sat near the back (see photo) but relatively close and he did not ignore us. He came to the edge of the stage and pointed: each of us thought/knew he was pointing at us individually, and we waved back. What a shame: Springsteen is the champion of the American working class, a supporter of Barack Obama and New Jersey, where he grew up and still lives. Almost none of this found its way into the Homebush Bay arena. He was awfully far from home, but it would have been nice to feel that connection. Freakiest moment: When the lights came up and I realised that there were about six men and women perched in the rigging about 20 meters above the stage, pointing spot lights and strapped into little seats. When did they get there? How would they get down? Were they ever scared? The most memorable concert I have been at, and I am a 30 year fan. There is something truly delightful when a director has the courage to make a film like “Performance”, which is totally devoted to classical music. We have seen biopics of famous composers – Mozart, Beethoven, Strauss, Chopin, Handel, Bach and Tchaikovsky all come to mind – but “Performance” is the first one I can recall featuring a fictional string quartet. Well, not quite fictional. Writer/director Yaron Zilberman (who previously directed the documentary “Waterworks”, about Austrian Jewish swimmers during the Nazi period) has based his film on the personal histories of three real-life quartets. Set in modern-day New York City, “The Fugue” quartet is facing a major predicament after 25 years of world-wide success. The founder and spiritual leader, cellist Peter Mitchell (played by Christopher Walken, in an uncharacteristically non-malevolent role) has been diagnosed with Parkinson’s disease, confirming the virtual end of his career. What to do? Replace him or go their separate ways? Long-simmering tensions and resentments arise between the other three members – cellist Juliette Gelbart (Catherine Keener), her husband and second violinist Robert (Philip Seymour Hoffman), first violinist Daniel Lerner (Mark Ivanir). When Robert states that he would like to share the first violin role with Daniel, he precipitates a crisis that will eventually encompass all members as well as the Gelbarts’ daughter. The film is framed around the quartet’s plans to play Beethoven’s String Quartet Number 14 in C-Sharp minor, also known as “Opus 131” (how it is referred to in this film). Opus 131 consists of seven movements played without a break (instead of the usual four), and is reportedly very challenging even for the most experienced musicians. The word “Jew” is never spoken in “Performance”, and many non-Jews will not realise how totally, completely and thoroughly Jewish this film is: every major character except one (Walken) is Jewish, as are the film’s director, writers and producers. New York City also features almost as a character in its own right (hints of Woody Allen’s “Manhattan”), all shot in a snowy but bright winter. All of the characters had attended or taught at the Julliard School of Music, New York City’s famous music conservatory. Scenes take place in the Upper West and Upper East Sides of Manhattan, including iconic locations like the Central Park Reservoir, the Metropolitan Museum of Art and the Frick Collection. Action also takes place in four different flats, each one of them carefully reflecting its inhabitants’ personalities and tastes. In our special effects-driven digital age, “Performance” may very well get lost in the noise, but that would be a shame. Set against the background of professional musicians, it uses the opportunity to explore some of life’s bigger themes: ageing, infirmity, mentoring, missed chances and the sacrifices that we may make for our art. Additional note: In last weekend’s Sydney Morning Herald (9-10 March 2013), critic Sandra Hall’s review included some worthwhile insights. She called Wallace Shawn “a human signpost” whose “mere presence spells New York” (cute). She also captured the essence of the “Performance” in its understatement: Walken’s character shows uncommon stillness, “dignified melancholy” and “rueful downplaying”. This contrasts with Ivanir’s Daniel – who has never mastered that art of downplaying and Hoffman’s Peter – who “has never had to try”. No one knows what the future of the music business will look like, but the near future of listening to music looks a lot like 1960. People will listen, for free, to music that comes out of a stationary box that sits indoors. They’ll listen to music that comes out of an object that fits in the hand, and they’ll listen to music in the car. That box was once a radio or a stereo; now it’s a computer. The hand-held device that was once a plastic AM radio is now likely to be a smart phone. The car is still a car, though its stereio now plays satellite radio (ed note: not here in Australia!) and MP3s. Frere-Jones notes that there is in fact a whole series of software and approaches that makes this new model of “free” listening (as compared to the pay model of “on demand” listening) different. But isn’t it astonishing how much we look like 50 years ago? The French have a wonderful saying for that … “Plus ca change, plus c’est la meme chose” (the more things change, the more they stay the same). Frere-Jones goes on to point out that “broadcast and on-demand models are governed by different rules” but are similar in that neither of them “depends on downloading files or finding storage space on a personal computer”. And that Google and Apple are the two companies that “will likely change the landscape of online audio in a matter of months”. I am old enough to remember the transistor radio – amazing to think that all of that engineering that has gone into the iPhone and other super-smart phones is only starting to reach the musical streaming capabilities of those old plastic battery-powered transistor radios.